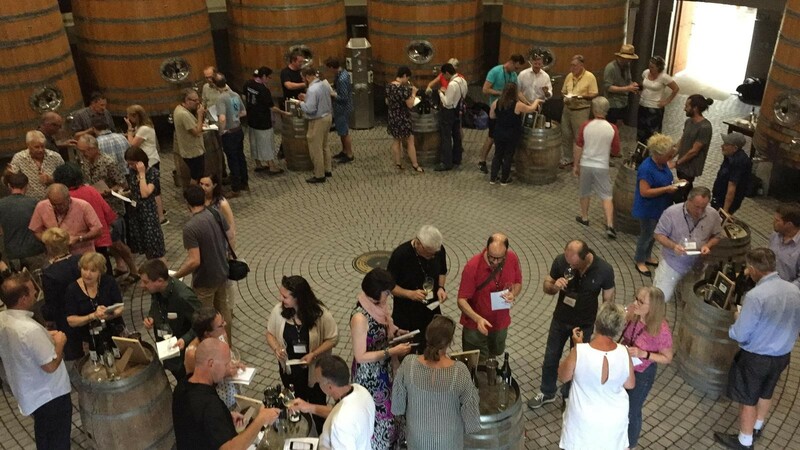 Not intended to be exhaustive – simply a summary of some of the highlights, key learnings, wines/producers I will be looking out for in the future…….and general reflections. Climate change – it is more likely to be wetter in winter when vines don’t need more water and dryer in summer when they do! But it was mentioned on more than one occasion that, at present, New Zealand’s vineyards appear to be less affected by climate change than those in many other parts of the world. 98% of NZ’s vineyard certified sustainable. Water use, waste management/recycling, biodiversity. An extension SWNZCI (continuous improvement) goes further and includes economic sustainability. As James Milton says “you can’t be green if you’re always in the red”. Even if NZ wine producers want to dry farm, it is often not realistic because so many soils are so porous. During veraison a vine’s water needs double. If you green harvest you halve a vine’s water requirement, so can be useful when water is short. Damien Yvon of Clos Henri: some vineyards in Marlborough irrigate up to 8 litres of water per vine per day. Water generally in good supply in the Wairau Valley but can be less readily available in the hills. 2.5 times the planting density of his vineyards compared to others, leading to more deeply-rooted vines which he believes lead to more balanced acidity in the wine. Also uses Riparian rootstock which is less vigorous than others used in the valley. The challenge is to understand soils, especially with regard to water holding capacity. The safe option is to over irrigate rather than under irrigate. However, this can potentially lead to yields being higher than desired. Central Otago is well-suited to organic and biodynamic viticulture from a canopy point of view as it is dry. However, it is less well-suited from a soil fertility point of view, as added fertiliser is needed in the vineyards with less top soil. All the same, a large number of producers seem to be organic, biodynamic or in conversion. Yields in Central Otago are lower than in Marlborough but even 10 tonnes/ha are considered too high by Rudi Bauer of Quartz Reef . Mind you, it is hard to see how many producers could operate profitably at the 4.5 tonnes/ha that he sees as the optimum. Yields at Valli in Gibbston average around 4 tonnes/ha. Pests – Lowburn Valley reckon that they spend about NZ€400/ha a year on rabbit control. Rudi Bauer “shiny leaves normally indicate a healthy vine”. It’s estimated that Clayvin vineyard, with its higher planting density, might be twice as expensive to manage each year as other vineyards. Wines made with a higher percentage of whole bunch seem to support a higher percentage of new oak. Kusuda – less concerned about oxidation of the must prior to fermentation which he thinks makes the wine look older for first 2 or 3 years, but ultimately ensures it is better suited to longer ageing. More measured use of SO2. Though Carrick’s Billet Doux was the only zero-sulphur wine tasted. Clay and limestone mix. Bell Hill only planted in 1997, so young region, although other vines planted in 1970’s. Favourite producers: Bell Hill, Pyramid Valley, Black Estate, The Boneline. Pegasus Bay probably the best known producer in the area, but I found the reductive element in their wines too dominant. Extraordinary that the founder of the Pyramid Valley vineyard reckoned that he would get one outstanding vintage in ten! Certainly a very cool site at 320 metres altitude and with only 1000 degree days. Chosen because of the limestone component in the soil (as was Bell Hill), and the Chardonnays displayed a noticeable similarity to Chablis in terms of structure and flavour profile. Includes Martinborough (first planted 1984 – Abel clone, also known as the Gumboot clone and reputedly stolen from Romanée-Conti) and Gladstone. Low yields – dream of 10 tonnes/ha whereas Marlborough routinely gets 15 plus. Frost a major problem. Key element in Martinborough is the wind which comes in from the south and toughens the grapes, leading to more structured Pinot than elsewhere in NZ. Big new plantings in Te Muna from Craggy Range, mainly to supply more Sauvignon Blanc; presumably an indication that Craggy Range expect regionality to play a bigger role in future because yields here will almost certainly be lower than in Marlborough. Lowish humidity so well suited to organic viticulture. Powdery mildew a problem but this can be treated with sulphur, so organic viticulture very much possible. It is downy mildew that must be treated with copper and is hard to manage organically. Low fertility, alluvial soils may pose more of a problem for organic producers as they require added fertiliser. Wairau Valley very much a monoculture – as opposed to Wairarapa and Central Otago where many other fruits are grown alongside vines. Yarrum Vineyard – supplies Dog Point, Greywacke and Fromm. 2019 – a lot of water-stressed vines, especially in the hills. Dangerous to generalise but yields in Awatere are lower than those in Wairau. The scale of the Yealands project in Awatere is ambitious and impressive – and they are aiming for 10 to 12 tonnes/ha. Some very good oak-fermented Sauvignons were tasted, especially from Vavasour, Marisco, Spy Valley and the consistently outstanding Greywacke (their Wild Sauvignon). But I see that, at one stage in my notes, I did write that I would still have preferred an oak-fermented Chardonnay…..
Only one rosé tasted, and a good one, from Marisco. Given the amount of Pinot Noir in Marlborough that producers acknowledge has been planted on the wrong sites, one must wonder if we will see more rosé in future? Outstanding producers that I did not know too well before included Clos Henri, Fromm and Giesen. I was also consistently impressed by the Nautilus wines that we tasted through the trip. 2000 ha and the only continental climate in NZ, with mountains to the west protecting against the prevailing weather. The region can even get frost at harvest time. Consolidation in recent years, with Mount Difficulty, Akarua and Peregrine all expanding. Gibbston Valley – some of the earliest plantings, generally 20% cooler than Cromwell Basin, so grapes picked 3 weeks later. They are normally the last to pick. Alexandra more continental, hotter and drier but vineyards cooled by afternoon winds. The producers were keen to emphasise the differences in soils between the sub-regions, but I think most of the group felt that the differences in climate between locations was the bigger determinant of style and quality. For instance in Northburn on the east side of Lake Dunstan where Cloudy Bay have their vines, the highest temperature recorded was 37C and that was at 7 o’clock in the evening. Whereas at Burn Cottage on the West side, the highest recorded temperature was 28C and that at 4 o’clock, as soon after that the sun sinks behind the hills. The differences in soils probably have a bigger influence on irrigation and canopy management decisions. As in Hawkes Bay, a noticeable shift with Pinot Noir towards earlier picking, higher natural acidity, less new oak and lower alcohols. Two Paddocks for instance, who make a particularly fresh, fragrant style, aim for 13%. Other key areas of interest/research include fermenting with wild yeast, whole bunch fermentation and no filtration. 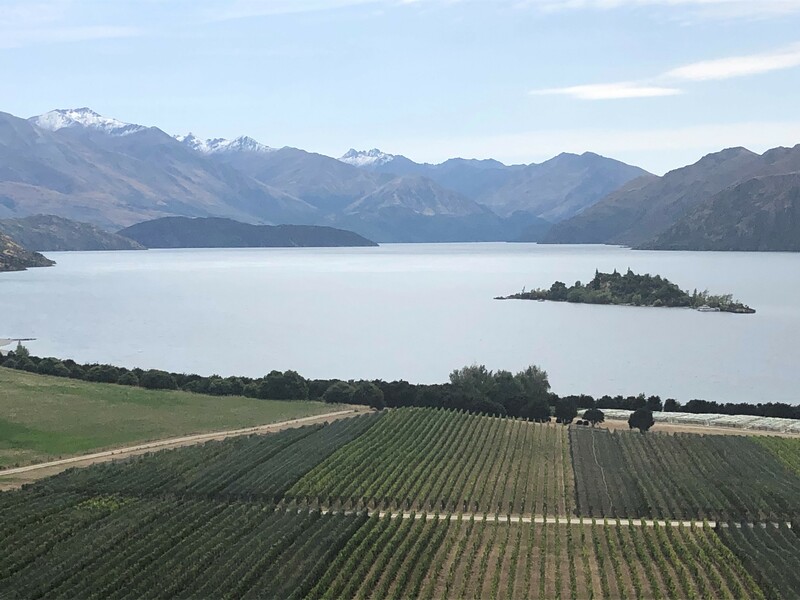 One high quality producer, Aurum, is selling their more approachable Pinot Noir in kegs to a Queenstown restaurant: a good, sustainable initiative and, as tourism in Otago increases, it is easy to see the local producers selling a higher percentage of their production locally. 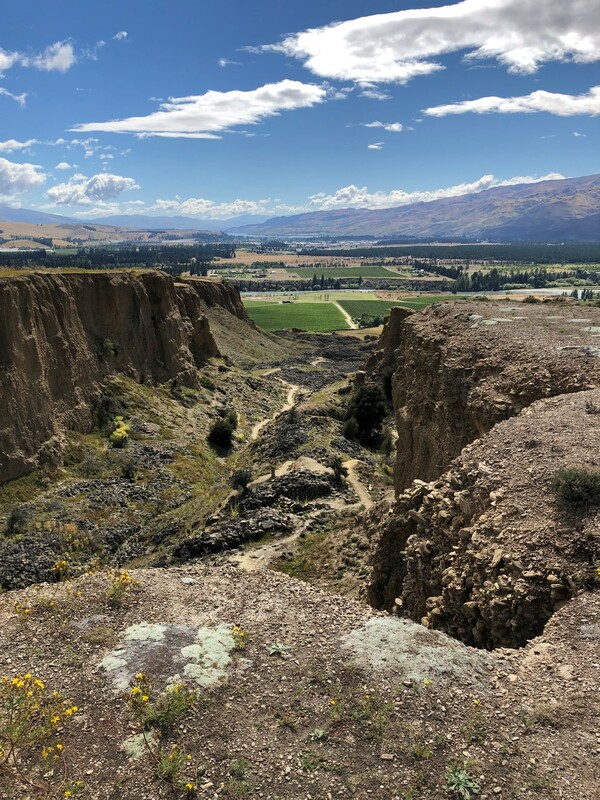 Gimblett Gravels – 800ha of which 35% is owned by Villa Maria’s properties (Villa Maria, Esk Valley, Vidal, Te Awa and Thornbury) – very well drained soil, too barren for other crops. Good for late ripening varieties as it is 4 to 6 degrees warmer than the coast. Cool nights so long growing season. Bridge Pa – More top soil so more moisture retained in a dry year, but not considered as consistent as Gimblett Gravels. Less structured wines than Gimblett Gravels, more rounded and more approachable when young. Compared to 10 years ago, higher acids, earlier picking, lower percentage of new oak, more use of larger format barrels, more emphasis on fruit. Best is yet to come…..
A highly insightful sub regional Syrah masterclass threw up especially good Syrahs from Church Road, Craggy Range (Le Sol), La Collina, Trinity Hill (Homage), Alpha Domus, Smith and Sheth, Te Mata (Bullnose), Stonecroft and Te Awanga. The strong maritime influence moderates temperatures, leading to a long growing season. With my Bordeaux-influenced palate, I loved the vertical tasting of Stonyridge Larose, with the wines developing genuine complexity at 8 years of age plus. The Te Motu Cabernet blends were also outstanding. The key outtake for me was the quality of the Syrahs, with stunning examples from Cable Bay, Obsidian, Stonyridge, Tantalus and Man O War. Given Waiheke’s status as the Long Island or Martha’s Vineyard of Auckland, wines from Waiheke are in high demand locally……..and command a significant price premium. 8% of NZ vineyard, 6.5% of production. Mendoza clone very popular since 1980’s. Problem in 90’s was that NZ’s Chardonnays were aged in oak not fermented in oak, so oak was not well integrated. Big improvement in quality and finesse now that they are fermented in oak too. Up to now the emphasis in Central, as they like to call Otago, has been very much on Pinot Noir. But the success of Felton Road and Gibbston Valley in particular with their Chardonnay is likely to mean more producers will be giving it higher priority in future. Other excellent examples from Ata Rangi, Fromm Clayvin Vineyard, Kumeu River and Craggy Range Les Beaux Cailloux, Martinborough Vineyard, Dog Point and Te Kairanga. Under 500 ha planted in NZ, probably 75% of that in Hawkes Bay. Lovely example from Giesen’s Clayvin Vineyard in Marlborough. Highly impressive flight in Martinborough, with Kusuda, Dry River and Cambridge Road all standing out. Cabernet/Merlot – Coleraine vertical impressive, with 1998 showing particularly good freshness and intensity still. Central Otago producers reckon that their premium Pinots will reach a peak at 4 to 5 years old – and then remain at that peak for a further few years. Mind you, one must bear in mind that the style of the wines has evolved demonstrably from later-picked, sometimes over-ripe wines up to 2010 or 2011 to fresher styles now that they are characterised by earlier picking, fresher acidity and less emphasis on new oak. Good fruit set at Felton Road. Could be because they have more top soil in many of their vineyards so they are more fertile; may also have escaped some of the late frosts as their vineyards are contoured rather than flat. Even so the target yield of 5.5 to 6 tonnes/ha is pretty low. 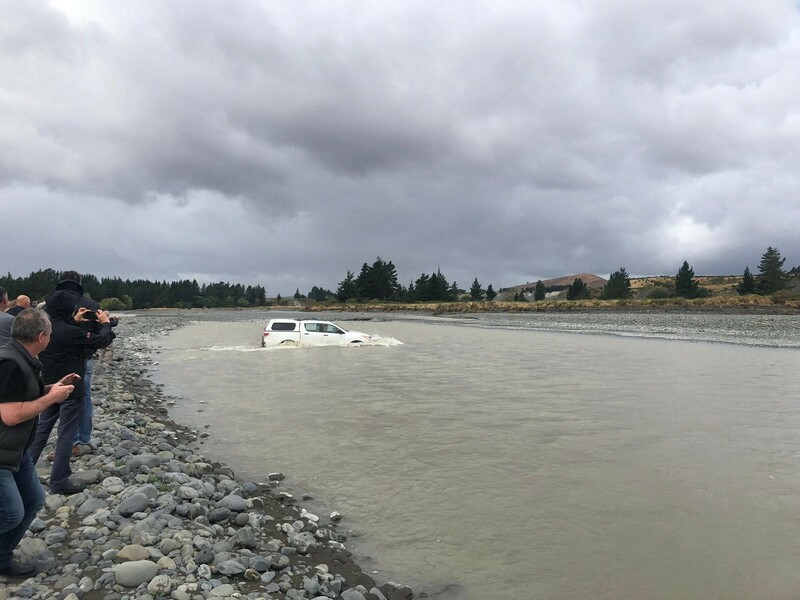 An extensive tasting in Martinborough reinforced the credentials of well-known producers such as Craggy Range, Escarpment, Ata Rangi, Kusuda, Dry River and Te Kairanga. Excellent producers I was not familiar with included Grava, Big Sky, Te Muna Valley and Cambridge Road. In the Gladstone sub-region of Wairarapa, Paddy Borthwick, Urla and Schubert stood out. I must admit to distinctly negative preconceptions of this grape and fortunately we did taste some excellent examples from Dry River, Astrolabe and Prophet’s Rock. However, having seen the bounteous-looking crop on the vines, I left with the opinion that the major attractions of Pinot Gris for most producers are its high yields and its popularity at Cellar Door. I am still not convinced it is the great white hope for export markets. Riesling featured regularly in our tastings without ever becoming a major focus of attention. There seems little doubt that the climate in many regions is well suited to Riesling; the only obstacle to its advance seems to be the lack of commercial demand (so an important one!). Lovely examples included Kusuda, Felton Road, Framingham and a very fine 2003 from Vavasour. Strong sense of community in Central Otago, plenty of technical exchange. Also an annual exchange with Burgundy whereby 4 students from Central do a harvest in Burgundy each year and vice-versa. 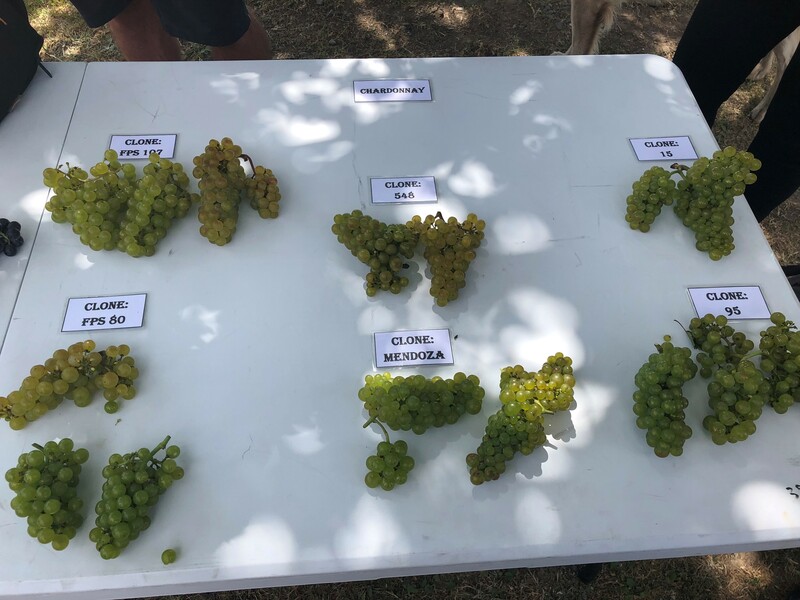 Extraordinary difference between yields on Sauvignon in Marlborough, where we heard of yields as high as 30 tonnes/ha – and Central Otago where yields in the best Pinot Noir sites could be as low as 4 tonnes/ha. Seen in that context, two obvious conclusions can be drawn: firstly that there will always be inexpensive Marlborough on the market as they have a lot of wine to sell………much of which has not been too expensive to produce. And secondly that high quality Central Otago Pinot Noir will never be cheap. Secondary markets. As the reputation of top wines from producers like Stonyridge, Felton Road and Kusuda grows internationally, it is easy to see a secondary market for these wines developing. In that context, it is refreshing to hear both Nigel Greening (Felton Road) and Stephen White (Stonyridge) say that they intend to keep pricing stable so that their wines continue to appeal to drinkers as well as investors.